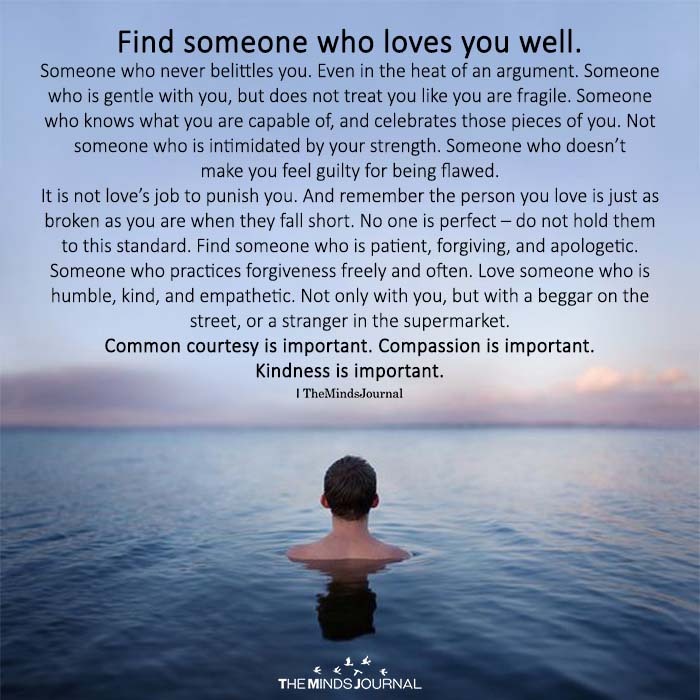 Find someone who loves you well. Someone who never belittles you. Even in the heat of an argument. Someone who is gentle with you, but does not treat you like you are fragile. Someone who knows what you are capable of, and celebrates those pieces of you. Not someone who is intimidated by your strength. Someone who doesn’t make you feel guilty for being flawed. It is not love’s job to punish you. And remember the person you love is just as broken as you are when they fall short. No one is perfect – do not hold them to this standard. Find someone who is patient, forgiving, and apologetic. Someone who practices forgiveness freely and often. Love someone who is humble, kind, and empathetic. Not only with you, but with a beggar on the street, or a stranger in the supermarket. Common courtesy is important. Compassion is important. Kindness is important. We don’t always end up together with people we love but that doesn’t mean we shouldn’t still love them, admire them and respect them for the amazing people that they are or were. Many special people will enter our lives and not all of them will be meant for us but one day we’ll find someone who is.